Pedigree needs no introduction to those who have pets especially dogs. 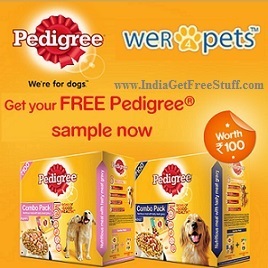 WeR4Pets is giving Pedigree Dog Food Free Sample worth Rs.100. Pedigree dog food completes dog nutirition needs. Pedigree Dog food gives our dog Healty skin and coat, Strong teeth, Superior Digestion and stronger Immune System. Now you can get Pedigree Dog Food Free Sample through wer4pets. Do you have cat also? Then, visit here to get Whiskas Cat Food Free Sample by Wer4Pets . Wer4Pets after Free Whiskas Cat Food Sample now has come up with Free Pedigree Dog Food Sample worth Rs.100. Just fill the form by visiting the link provided below to get it at your doorstep for free. 1. Visit here to order Free Pedigree Dog Food Sample. 2. Select whether the sample is needed for “Adult Dog” or “Puppy”. 3. Log in with Facebook or Google to automatically fill the form. Otherwise you can fill it manually by entering Name, Mobile Number, Email, Address etc. 4. You will get an on-screen message: “Your Free Pedigree Dog Food Sample will reach in 7 days”. Delivery may vary based on pincode. Pedigree Petfoods is a subsidiary of the American group Mars. Incorporated specializing in pet food, with factories in England at Melton Mowbray, Peterborough and Birstall, Leeds. Offices at Waltham-on-the-Wolds. The Pedigree Foundation is a philanthropic organization dedicated to helping dogs in need find loving homes. It was formed in 1997. The foundation provides grants to dog shelters and breed rescue organizations. Help dog lovers adopt, volunteer, and make donations. According to the foundation’s FAQ site, it has raised more than $4 million to date and in 2008. It distributed more than $1.1 million in grant money to more than 500 shelters and breed rescues. Use of awarded grant money by qualified recipients is virtually unrestricted But is most often used for shelter improvements or veterinary care. The current slogan of Pedigree dog food is “We’re for dogs”. Enjoy the Pedigree Dog Food Free Sample by WeR4Pets.